Today we have a really cool giveaway contest Photoshop Brushes Packs for designers from Vectorpack.net. 3 lucky winners can choose 5 brushes packs from Vectorpack.net website. 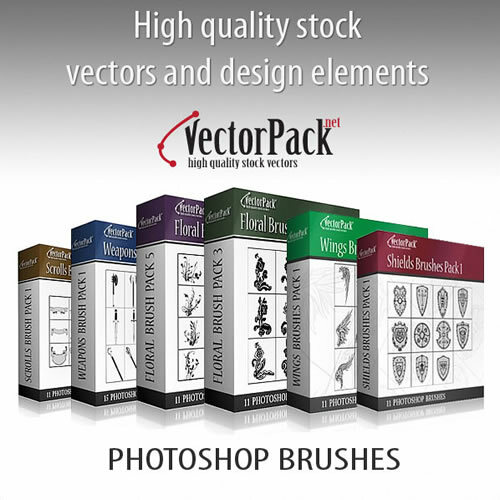 Choose your preferred packs from the VectorPack.net site and enjoy using these good lucking Photoshop brushes! Vectorpack.net is a new website that provides high-quality stock vectors and design elements for designers worldwide. The site has just opened, so stay tuned to see their products to come because they will post new vector packs every week. As they plan to have quite a lot of contests, frequently check their webpage to see what’s new. You can check here the Photoshop brushes you want to win. As usual, the contest is comment to enter and it will close on the 19th of May, at Midnight. Please state the packs you would like to win in your comments. The contest should start on the 13th of May and it should last till the 19th of May so that, on the 20th of May, we can announce the winners. Each of the participants to the contest should write the name of the 5 packs they would like to win in their comment so as for us to know how to award them. They should also leave their e-mail address for us to be able to send them their prize. Just comment on this post saying if you were one of the winners, what packs you would choose and what you would use it for. All comments will be accepted until May 19th, 2011. Winner will be announcing on May 20th, 2011. 3 winners will be chosen using Random.org’s List Randomizer after the contest ends. UPDATE: The contest has ended. Our randomly selected winners are Yuni Ardita Sari Dewi, Darius and Kim Wylie. Enjoy the vector packs! If I win, I’ll select texture brushes.They’re more versatile and bring added interest to any design. Most probably I love to have all of these, but if you said choose only one I will be go with The Shields Brushes Pack. Splash Brushes Pack 1, 2, Floral Brushes Pack 2, 3, 4. If I win, I’ll choose the texture set. They’re awesome, useful and relevant to any design! I love to have floral brush pack 1… Cos I love florals.. I would like to try the splash (Splash Brushes Pack 1, 2, Wing Brushes 1, Spray Brush 1 ) and texture brush sets to give additional perspective to the photographic images I work with and try to see if I can incorporate their use into a graphic tablet. ! Thanks for bringin’ up dis giveaway! I forgot to say what I would use the Photoshop brush packs for. lol I would use them as elements in my graphic artworks. I plan on adding the wings to a character in one of graphics artworks. I’m thinking about adding some feathers to the wings to give them even more of a unique look. I’m thinking about adding the floral brushes to a background or use them to make a frame. The spray brushes would add a nice effect to a grungy background or I could use them as frames. The splash brushes could be added to a grungy background too or they could add a nice splattered paint or water effect to one of my artworks. The uses for all of the brush packs are endless. Hi everybody! Thank you for participating to our contest. The prizes have been sent to the winners. Make sure to visit VectorPack.net as often as possible as we will upload new packs on the 1st and the 15th of every month and as we will often have promotional sales.